If you are considering selling your property on Longboat Key, now is a great time! With little competition and increasing prices, you should take advantage of the current market. If you are thinking about a purchase, you will want to act now as prices are on the rise! Summertime in Sarasota is considered a slow time as seasonal residents have gone north. However, people who are looking for a new winter home on or close to the beach are searching for a place well in advance of winter. I am here to list, market and show homes year round, so you don't need to worry about the season. Sales on Longboat Key continue their strength, even though the inventory is down 3.9 percent from last year at this time. Inventory is measured by the number of homes that sell within six months. When there is low inventory, sale prices rise. Year over year, the number of properties sold is up 3.2 percent and the number of pending sales is up 20.2 percent. For properties $1 Million and more, the number available is down 13.1 percent from this time last year. However, the number of properties sold is up 16.4 percent and pending sales are up 1.4 percent. With lower inventory and more sales, this means that the prices are up over last year by an average of 3.2 percent. 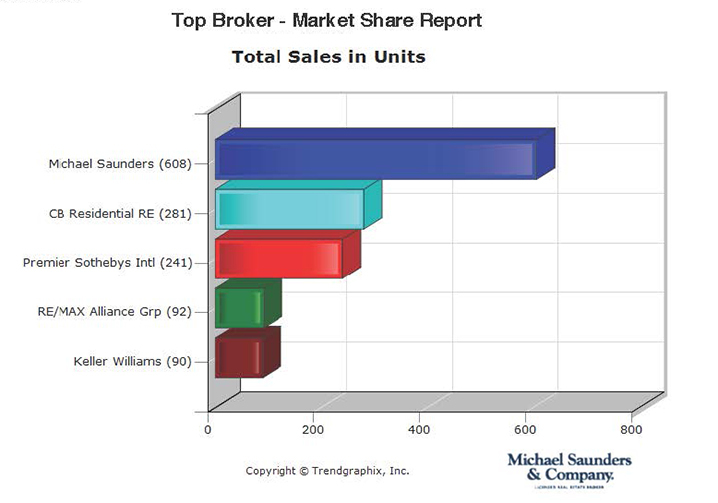 According to Trendgraphics, Michael Saunders & Company continues to lead the market in sales for luxury homes over $1 million on Longboat Key. In the last 12 months, Michael Saunders and Company has sold 608 properties at $1 million or more on the Key. The next closest real estate brokerage company sold only 281 properties – more than 50 percent fewer!